These are a take on a previous post, Baked Salted Caramel Chocolate Doughnuts. They use the same recipe as the base. But just to refresh your memory, let’s go through the motions again. Whisk or sift together the dry ingredients until well combined. 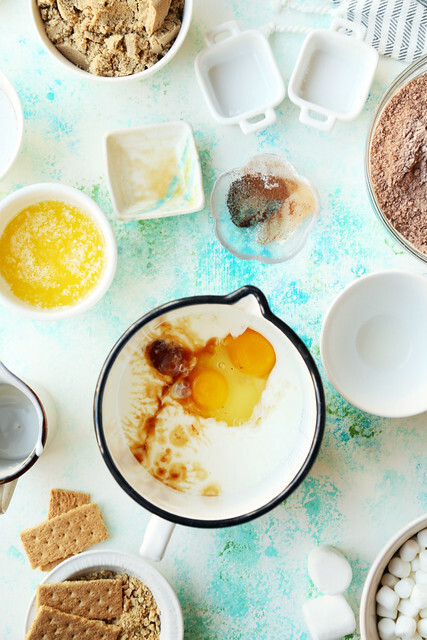 Set aside, and then in a separate bowl, whisk together the wet ingredients. Make a well in the center of the dry ingredients and then pour in the wet ingredients. Stir together until just combined. 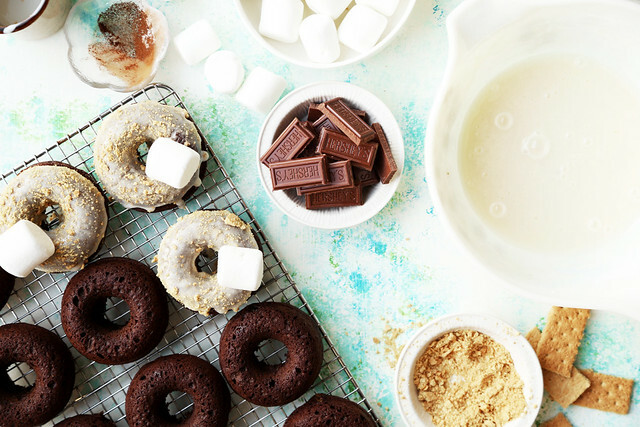 Once the batter comes together, spoon or pipe it into a baked doughnut pan, filling up to the top of each. Bake until puffed up and a toothpick inserted in the middle comes out clean, about 10 to 12 minutes. Let the doughnuts cool in the pan, then invert onto a wire rack. 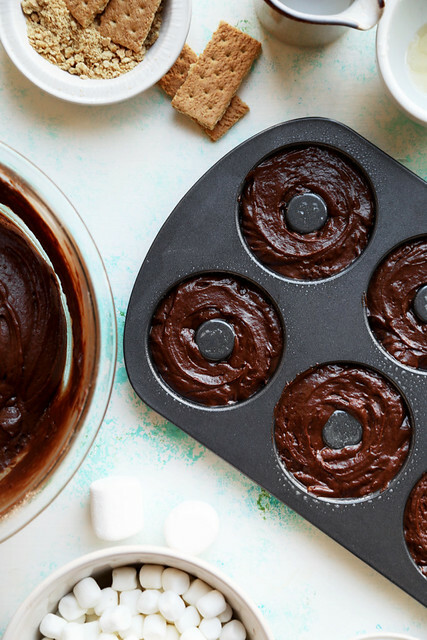 Once at room temperature, they’re ready to be glazed and topped. Let’s make the marshmallow glaze. 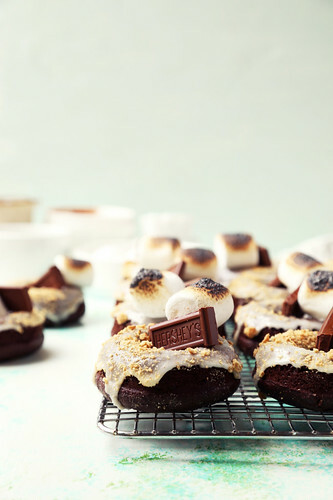 This is the perfect glaze for these s’mores doughnuts because of the marshmallow flavor! Combine the butter and water in a saucepan. Cook on until the butter has melted. 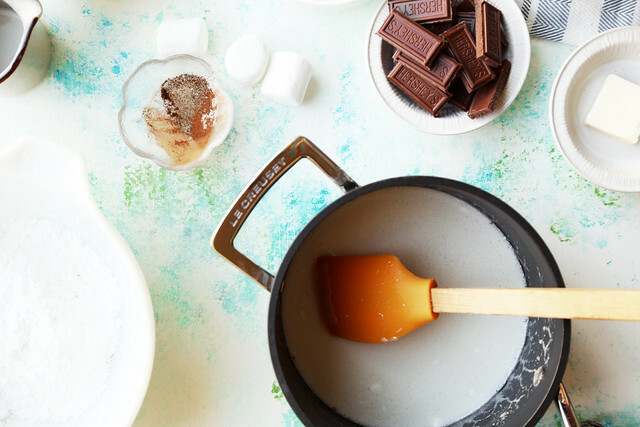 Stir in the mini marshmallows and cook until fully melted through. Pour the melted marshmallow mixture into the bowl with the powdered sugar, vanilla and salt. Whisk until completely smooth. 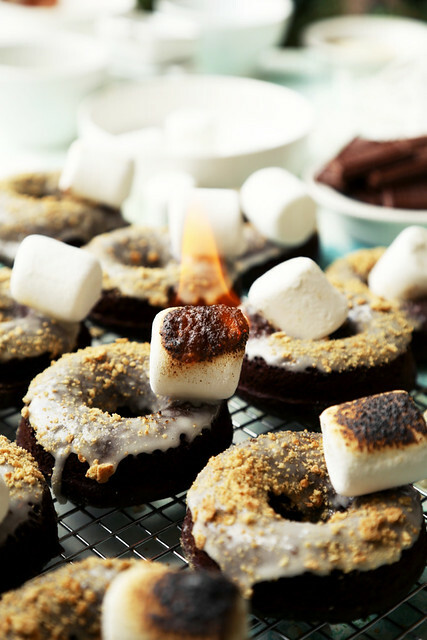 Dunk the doughnuts, one at a time, into the glaze—allowing the excess glaze to drop off—and while the glaze is still wet, sprinkle with the crushed graham crackers and top with the large marshmallows. 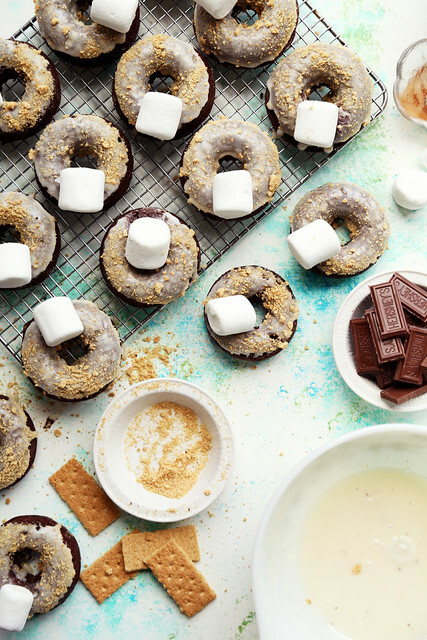 Continue dipping and sprinkling until all the doughnuts are topped. 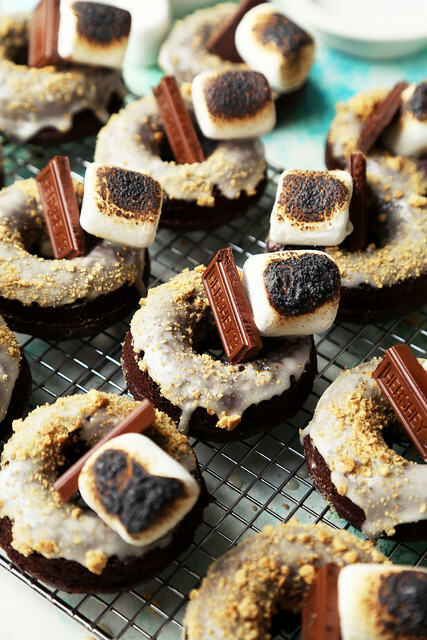 Let them sit for about 10 minutes to allow them the glaze and marshmallows to set. Let’s take these to the next level. 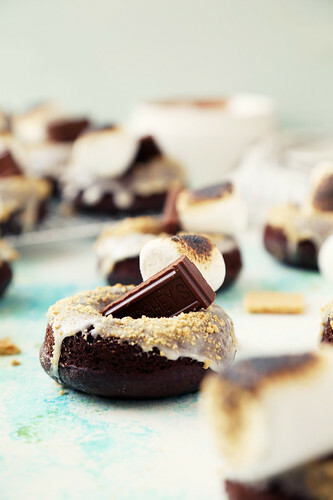 Grab your blow torch or kitchen baking torch and blast the marshmallows until charred and almost burnt. I love burnt marshmallows so I tend to go overboard a bit. The marshmallows might catch on fire, if they do, just blow them out and they’ll be fine. Don’t start panicking. It’s a controlled fire situation, I promise. The faster you blow out the flame, the less charred they’ll be. 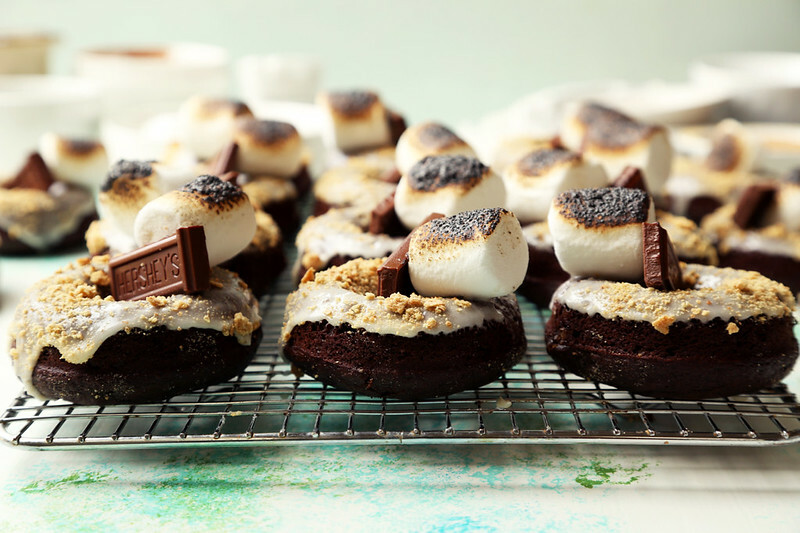 Once they’re all torched, top them with a piece of chocolate, because these are s’mores after all and there can never be enough chocolate. These can be eaten right away or covered with plastic wrap and kept at room temperature for up to 2 days. Anything longer, and the doughnuts will start to get stale, but you don’t have to worry because I don’t think these will even make it to the second day. I really like baked doughnuts because they don’t require all of the work as regular fried doughnuts. Think about it, you don’t have to make a yeast dough and let it rest and rise, and then cut them out and then rise again and then heat up a giant pot of oil and then fry them and then drain them and then top them. Who has that kind of time, this time of year? Don’t get me wrong though, I love regular doughnuts just the same. They’re my first true love. Baked will always come second, but they’re a good second. If you’re watching what you’re eating because of the New Year, I’m sorry. If you’re currently in a cleanse, I’m sorry you’re going through that. Keep these in the back of your mind or pin them for later. Then once you’re free or on your cheat day, pull this recipe out and make them for yourself because you deserve a treat. 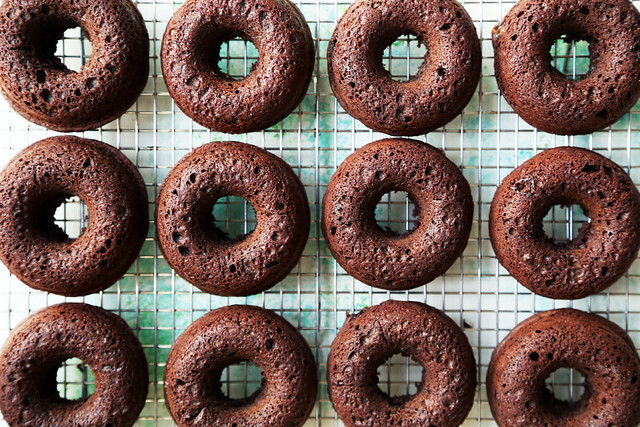 2016 is for baked doughnuts. 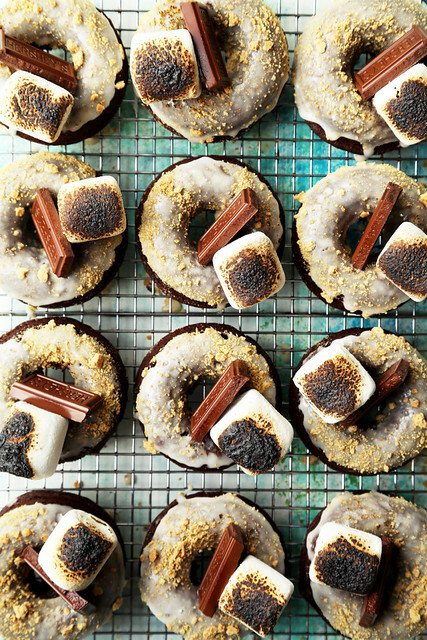 These doughnuts are just like the classic s'mores we love. 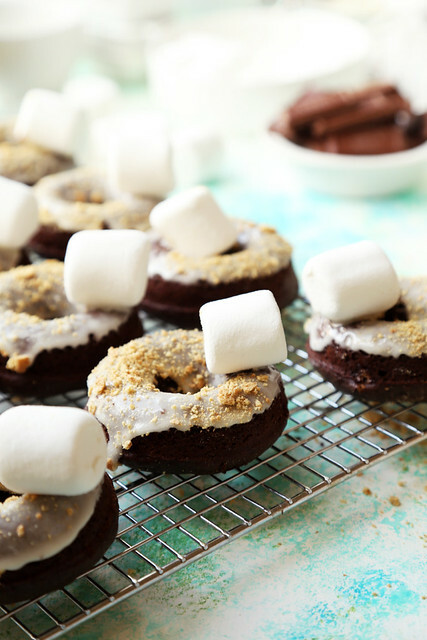 Chocolate, marshmallow and graham crackers on a baked chocolate doughnut! Preheat oven to 350°F. Grease two doughnut pans with cooking spray. If you only have one, you'll have to bake the doughnuts in batches. Set to the side. 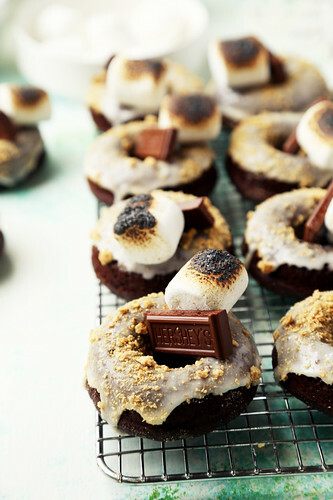 To make the doughnuts: In a large bowl, combine the flour, brown sugar, cocoa powder, baking powder, baking soda, salt, espresso powder and cinnamon. Make a well in the center of the bowl. 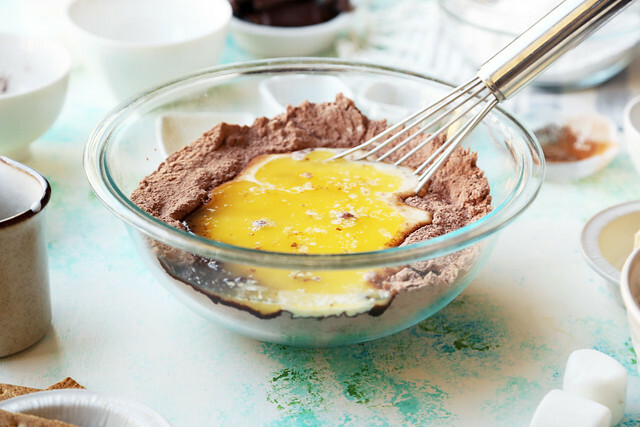 In a separate bowl, whisk together the eggs, buttermilk, vanilla extract, and melted butter. Pour the wet ingredients into the dry and fold until they're just combined. Do not over-mix. Fill the prepared doughnut pan about ¾ of the way up. Bake for about 10 to 12 minutes or until a toothpick inserted in the middle comes out clean. Remove from the oven and allow to cool down in the pan. Transfer the doughnuts to a wire rack and allow to cool completely. 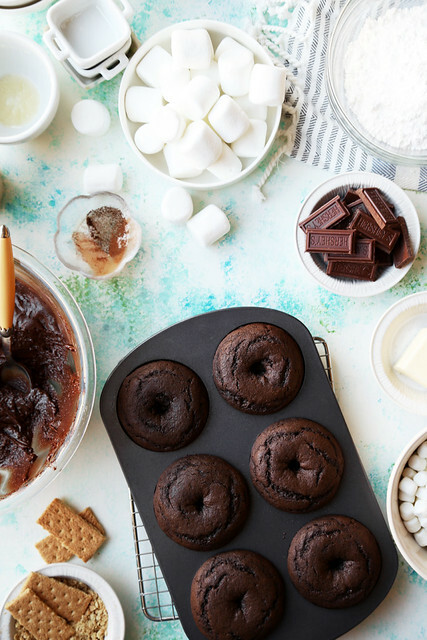 If you only have one pan, keep baking the doughnuts in batch until all the batter is used. Allow to cool completely before glazing. To make the glaze: Combine the butter and ¼ cup water in a small saucepan, and cook over medium until the butter has melted. 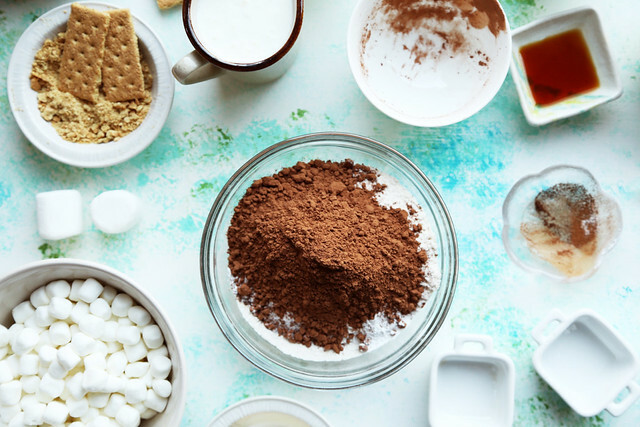 Add the mini marshmallows and cook, stirring often, until they've completely melted. Transfer to a large bowl, and whisk together with the sugar, salt and vanilla until well combined. Let cool slightly. Dip the doughnuts, one at a time, allowing the excess to drain off. 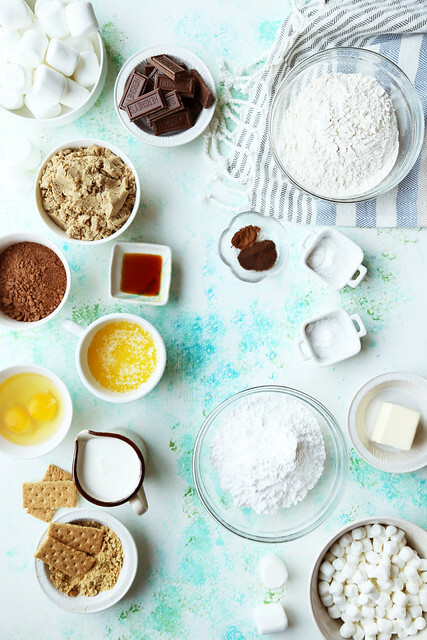 Place on a wire rack set over a baking sheet. 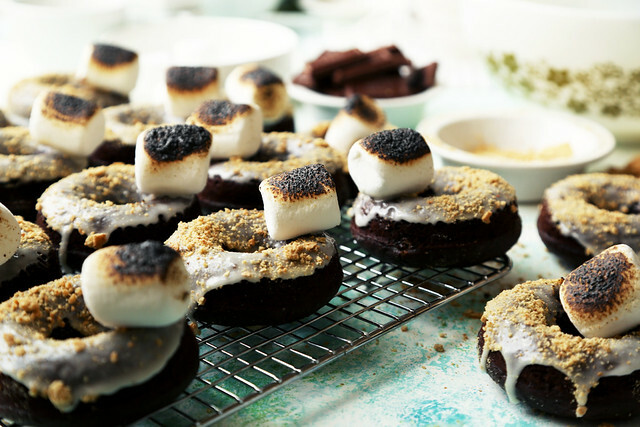 While the glaze is still well, sprinkle with graham cracker crumbs and a large marshmallow. Let sit for about 5 to 10 minutes to set. Toast the marshmallows with a kitchen torch until charred. Garnish with a piece of chocolate. Serve immediately or wrap in plastic and store at room temperature for up to 2 days. 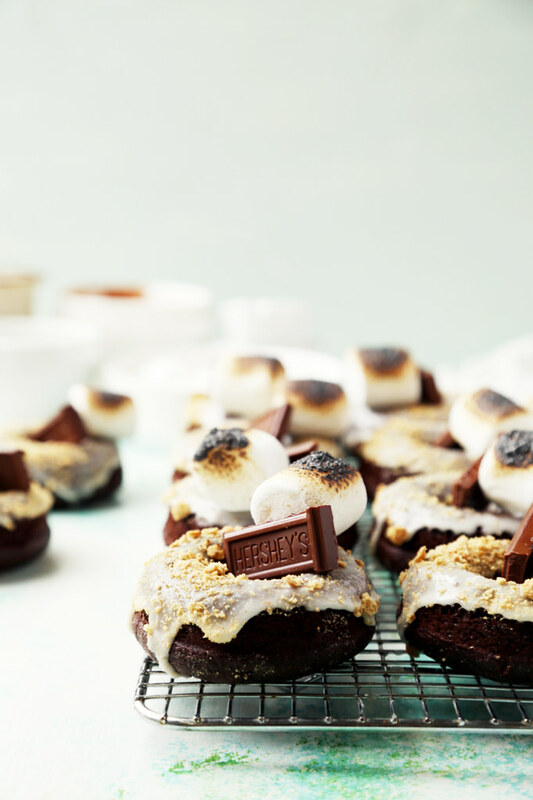 I can’t decide what I love most about these donuts…the burnt marshmallow on top? The glaze? The base?!?! I’m swooning in the biggest way right now! Well. . .let’s just say that I am happy knowing that I am not the only one who was deprived of ooey, gooey, chocolatey s’mores while growing up. 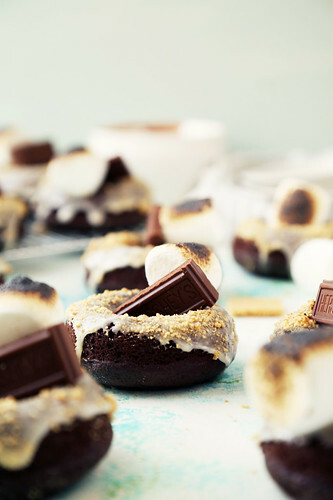 Good news is that as adults we can catch up by gorging on as many s’mores as we can stomach. 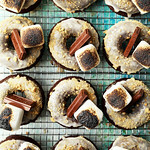 And I can’t think of a better way to do this than with these divine s’mores doughnuts. Not only do they look tasty but they are also easy on the eyes.